General Formula: CnH2n+1COOH, n = 0, 1, 2, …..
Carboxylic Acids are weak acid. The functional group of carboxylic acids is carboxyl group. When dissolve in water, the carboxyl group will ionise to produce a hydrogen ion. 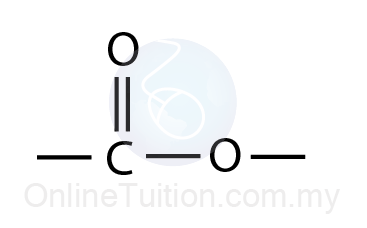 All carboxylic acid names end with the suffix ‘oic’. 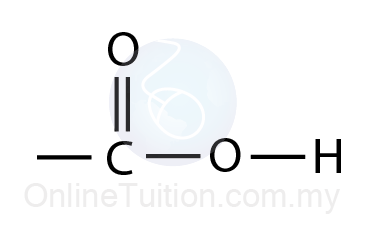 For example, methanoic acid, ethanoic acid, propanoic acid and butanoic acid. The carboxylic acid is named by replace the ending “ane” from the name of alkane with “anoic acid”. Unlike alcohol, the position of the functional group (the carboxyl group) need not be stated in the name of carboxylic acid. The greater the number of carbons in the molecule, the higher the boiling point of a carboxylic acid. The boiling points of carboxylic acids are higher than the alcohols of same number of carbons. The small molecule carboxylic acid such as methanoic acid and ethanoic acid are soluble in water. The solubility of the bigger acids decreases as the size of the molecule increases. This is because the longer hydrocarbon “tails” of the molecules get between water molecules and break hydrogen bonds. Alcohols can be oxidised to carboxylic acids using potassium dichromate(VI) solution in the presence of dilute sulphuric acid. Chemical Equation below represents the reaction. 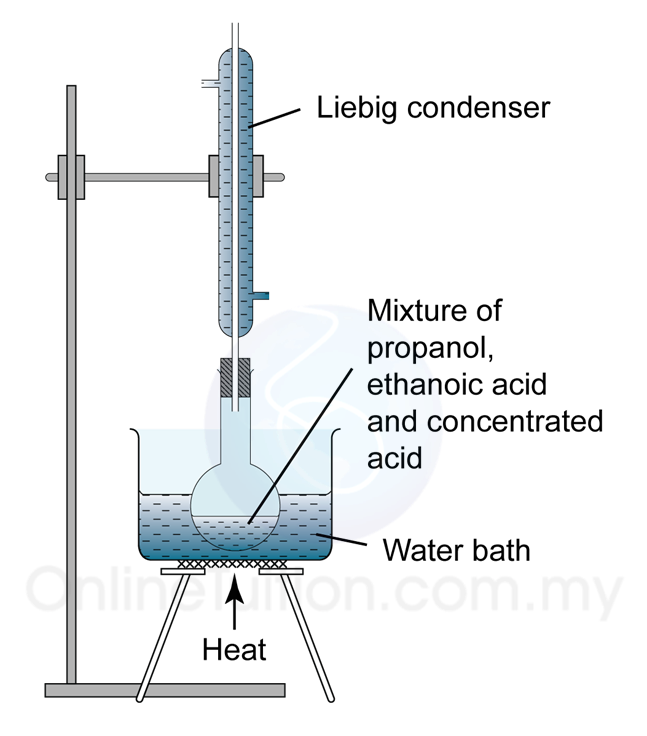 The figure below shows the apparatus set up to prepare ethanoic acid. The mixture is heated under reflux to prevent the ethanol to evaporate and escape to the surrounding before it has time to be oxidised to the carboxylic acid. 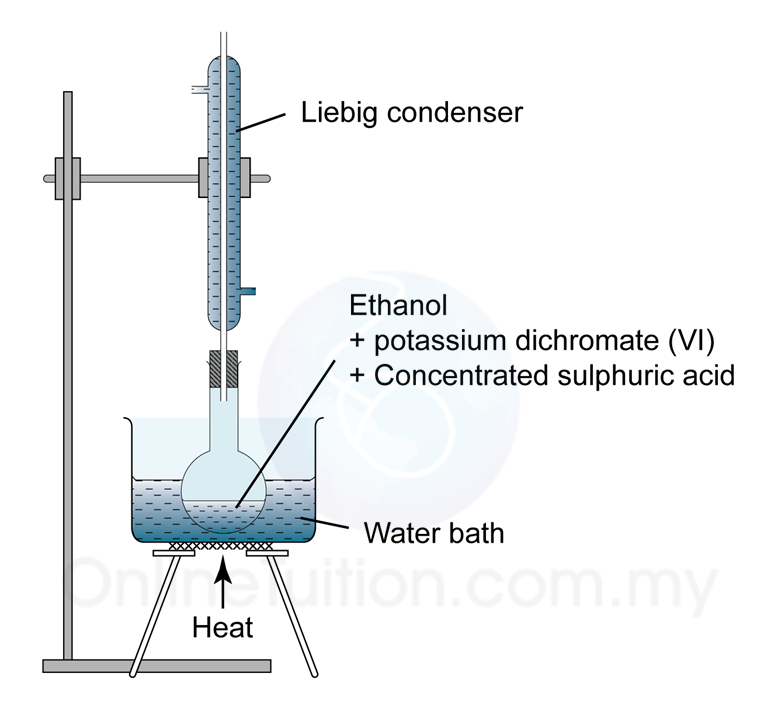 Ethanol vapour will condense into liquid in the Liebig condenser and flow back into the flask to complete the reaction. Ethanoic acid is a weak monoprotic acid. As such, its chemical properties are similar to acids such as hydrochloric acid, nitric acid and sulphuric acid. Carboxylic acids react with the more reactive metals to produce a salt and hydrogen. As other acids, carboxylic acids react with carbonate metal to produce a salt, water and carbon dioxide. As other acids, carboxylic acids react with base oxide or alkali to produce salt and water. Carboxylic acid reacts with alcohol with the presence of .concentrated sulphuric acid as catalyst to produce ester and water. The reactant mixture needs to be heated under reflux. Propyl ethanoate, CH3COOC2H5 can be prepared in the laboratory by heating a mixture of propanoic acid and ethanol, with concentrated sulphuric acid under reflux. The mixture is heated under reflux to prevent the alcohol and propyl ethanoate to evaporate and escape to the surrounding. Esters are non-hydrocarbon organic compounds containing carbon, hydrogen and oxygen. It is formed when a carboxylic acid reacts with an alcohol. Esters are produced when carboxylic acid reacts with alcohol in the presence of concentrated sulphuric acid as a catalyst. This reaction is called the esterification reaction. Ester can be found naturally in plants.